Purchase your Regular Sightseeing Bus ticket at the counter on the 2F of ESTA Sapporo Station Bus Terminal, and wait in front of the ticket counter. Staff will come to get you 5 minutes before boarding time for each course. 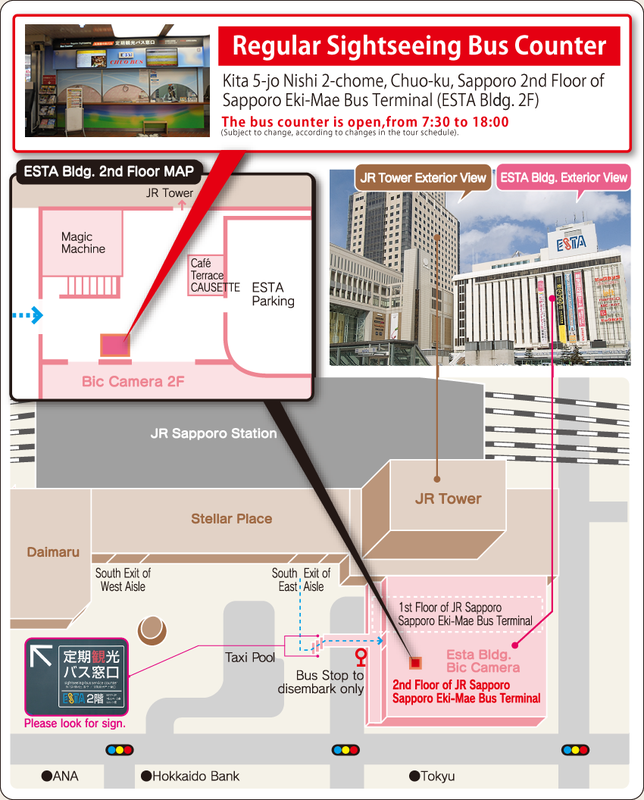 ◆How to get to the Regular Sightseeing Bus Ticket Counter at Sapporo Station Bus Terminal ESTA 2F. Unless otherwise noted, child fare applies to whom are between ages of 6-11 on the date the ticket is issued. Under the age of 5, when a seat is not required, there is no charge for one child per one adult. We thank you for choosing Hokkaido Chuo Bus Regular Sightseeing Bus for your travels.In order to avoid causing trouble to other customers and passengers, we ask that you please follow the rules givenbelow. Please set your watches to Japan time. Please set your mobile phones to manner mode on the bus. Please stay seated when the bus in in motion. Please keep your voice quiet during the trip. It is no smoking in the car. Please cooperate. Arrival can be late for a traffic jam. Our tour guides on the regular sightseeing buses can assist you only in Japanese. For any questions you may have during the course of the tour, please use our telephone translation service. Please be sure to mind the tour time and departure time at each destination. If you do not return to the bus in time for departure, the bus will not wait. Please be sure to take your bus ticket stub when you get off the bus at each destination. The bus ticket stub has the emergency contact information on the back. Please understand that the sightseeing guide may have to use a cellphone for emergency purposes, when at the lunch venue, while sightseeing or on the bus. 2. Due to traffic or weather conditions, buses may run late, so leave plenty of time after the tour to make your connections. 3. Fare refunds up to 2 hours before the start of the tour incur a ¥100 fee. No refunds will be made after that time. 5. The course of the tour may change without notice. Please confirm when applying. 6. In order to prevent global warming and air pollution, please note that bus engines are turned off at sightseeing stops, so air conditioning and heating will also be turned off. 7. There will be no increase in the number of buses on some courses. 8. Natural disasters (such as the expressway being closed due to adverse weather conditions) may cause delay or cancellation of tours. Please check the status of your tour each time. 9.Information given when reserving a tour may be used to: make reservations, issue tickets, and contact the customer. Information may also be used for statistical purposes. 10.Please set your watches to Japan time. 11.Please be sure to mind the tour time and departure time at each destination. If you do not return to the bus in time for departure, the bus will not wait. 12.Please understand that the sightseeing guide may have to use a cellphone for emergency purposes, when at the lunch venue, while sightseeing or on the bus. 13.Our tour guides on the regular sightseeing buses can assist you only in Japanese. For any questions you may have during the course of the tour, please use our telephone translation service. 14.Please be sure to take your bus ticket stub when you get off the bus at each destination. The bus ticket stub has the emergency contact information on the back. 15.Arrival can be late for a traffic jam. 16.Please stay seated when the bus in in motion.